The 300 dpi printhead on the TLP 3842 enables high quality, crisp, clear printing for labeling applications that require data such as two-dimensional barcodes, fine text, or composite graphics. Producing data on very small labels, for example laboratory vial labels or jewelry tags, is greatly enhanced by the high-density 300 dpi print resolution. 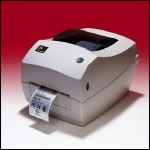 Model 3842-10300-0001, 300 DPI, 2 IPS Print Speed, 512KB SRAM, 1MB Flash, Serial, Parallel, USB, US Plug, EPL Language. Discontinued - Call for replacement. Model 3842-10301-0001, 300 DPI, 2 IPS Print Speed, 512KB SRAM, 1MB Flash, Dispenser, Serial, Parallel, USB, US Plug, EPL Language. Discontinued - Call for replacement. Model 3842-10302-0001, 300 DPI, 2 IPS Print Speed, 512KB SRAM, 1MB Flash, Cutter, Serial, Parallel, USB, US Plug, EPL Language. Discontinued - Call for replacement. Model 3842-10400-0001, 300 DPI, 2 IPS Print Speed, 512KB SRAM, 1MB Flash, Serial, 10Base-T Prt Server, US Plug, EPL Language. Discontinued - Call for replacement. Model 3842-10401-0001, 300 DPI, 2 IPS Print Speed, 512KB SRAM, 1MB Flash, Dispenser, Serial, 10Base-T Prt Server, US Plug, EPL Language. Discontinued - Call for replacement. Model 3842-10402-0001, 300 DPI, 2 IPS Print Speed, 512KB SRAM, 1MB Flash, Cutter, Serial, 10Base-T Prt Server, US Plug, EPL Language. Discontinued - Call for replacement.